On January 6, I was invited to a speech by Mexican President Andres Manuel Lopez Obrador (AMLO) in Juarez. 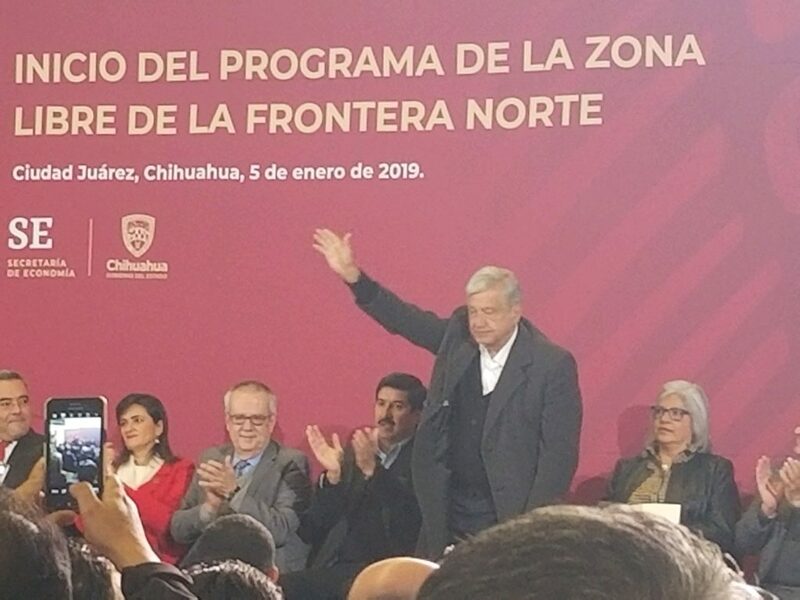 AMLO was traveling through Mexico’s northern border region to promote the January 1 launching of his northern border zone program, which he calls his “border free zone.” Comprised of 43 border municipalities, the elements of this program include doubling the minimum wage in the region to the equivalent of $9 dollars per day, decreasing the cost of fuel to the same cost in the U.S. border region, and cutting the value-added tax from 16 percent to 8 percent. A major goal is to attract new investment to Mexico’s border region, and the tool that will be used to do this is decreasing the corporate tax on the border from 30 percent to 20 percent. AMLO was welcomed by a delegation which included Chihuahua Governor Javier Corral, and Juarez Mayor Armando Cabada. He was accompanied on his trip by Graciela Marquez Colin, the Mexican Minister of the Economy. I was curious to see how AMLO would be received, given the fact that he is of a different political party than Corral, and some public differences have been noted. Corral spoke first, highlighting his state’s importance to the Mexican economy and emphasizing that Chihuahua needs infrastructure funding to keep growing. He noted that for every peso the state collects in taxes and sends to Mexico City, it only receives $0.42 centavos back in funding. He called for a better distribution of taxes between the federal and state governments. Corral also thanked ALMO for launching his new border program, but was concerned that very few details were in place. He ended his speech by saying that despite different ideologies, political stances, or even the way that each leader views democracy, they need to collaborate. Marquez Colin spoke next, telling the audience that raising productivity, developing local advantages, and more and better employment opportunities were the goals of the border free zone. Through a series of slides, she highlighted how important Mexico’s northern border, and particularly the State of Chihuahua, is to AMLO’s administration. Of the six Mexican border states, Chihuahua accounts for 12.7 percent of Foreign Direct Investment. Its eight municipalities directly on the border account for 32.5 percent of the exports generated by Mexico’s northern border region, and Chihuahua is Mexico’s number one exporting state. Marquez Colin emphasized that Mexico has to take advantage of the economic advantages of the U.S. border region, and that the U.S.-Mexico border region in general has advantages not found anywhere else in the world. AMLO followed and started by praising Juarez’s role in Mexican history. He then discussed how certain regions such as the southern part of Mexico have historically been neglected. His administration is focused on developing a transportation route to develop commercial opportunities across the Isthmus of Tehuantepec in southern Mexico, which connects the Pacific and Atlantic Oceans via a narrow 124-mile land strip. AMLO also stated that under the country’s energy reform, Mexico was promised an increase in its oil production, which has not transpired, and the country continues to import refined fuel – he was adamant that this will change. 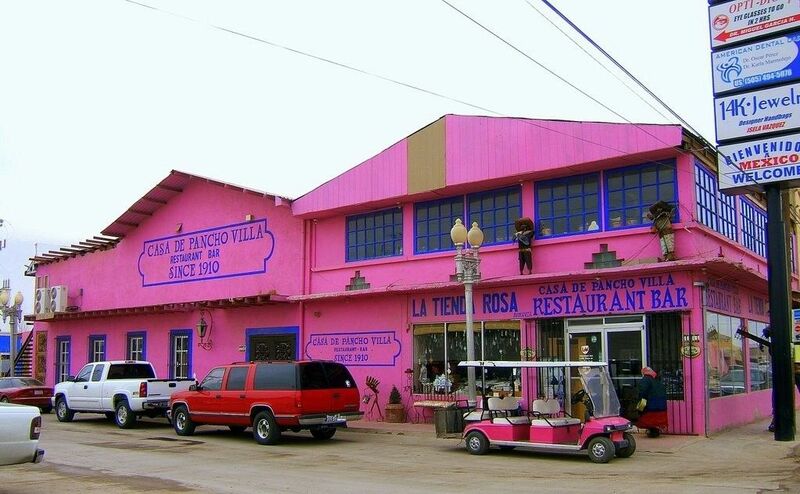 From the viewpoint of a U.S. businessman who works on the border, AMLO’s remarks bode well for the border region. I am encouraged that the new Mexican president has made border development and the effort to attract more investment here a priority. 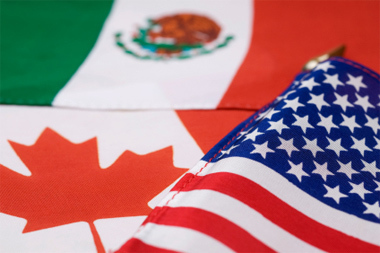 The U.S. side of the border can benefit by supplying new industry in Mexico. I am still concerned that raising wages, cutting taxes, decreasing energy costs, and starting major projects could cause inflation, which would derail AMLO’s efforts. However, the very fact that he is taking time to focus on the border is welcome news. November 2018 Article – A Place That We’re Joined, Not Separated	February 2019 Article – Where is a Wall Needed?